When Jesus said, "no man knows the day or hour," he nullified the past use of the Bible (or anything else) to "set dates" or predict when end time events will happen. But his words are not clear enough today alone to silence prophecy speculation. Some people think "day or hour" allows for knowing the year or is only code for the Day of Trumpets. On the opposite extreme, some think Jesus meant that his return could happen at any moment or that we could learn nothing about timing and therefore not even study his prophecies. Find out what Jesus really meant by looking at what he said in context...and also by considering what he did not say. In the Olivet Discourse (Matthew 24; Mark 13; Luke 21), Jesus fielded a question from his disciples that every believer since then has wanted to know. The question, of course, is when is Jesus coming back (Mt 24:3)? Mark 13:32 (HCSB) Now concerning that day or hour no one knows—neither the angels in heaven nor the Son—except the Father. Matthew 24:42 (HCSB) Therefore be alert, since you don’t know what day your Lord is coming. But what exactly did Jesus mean by this statement? It may seem plain and straightforward to many that he was telling us never set dates for his return. Nevertheless, there are many different interpretations of his words. Some go too far and some do not go far enough. #1: "You can't know the day or hour but you can know the year"
The "day or hour" phrasing is a little odd for English speakers. We use day and hour for only a few specific units of time. Day usually means 24 hours or the daylight portion of a day, while hour means 60 minutes. But if you check out the Bible usage of those terms, they are instead often equivalent with the English word "time." I imagine it would be easier for a Spanish speaker to catch this. When I moved to Costa Rica and learned the language, I had similar trouble expressing my thoughts due to being a native English-speaker. In Spanish the word tiempo is translated to English as time. Thus, when I wanted to express "time to go" or "time for supper" or "time for bed," I would choose the word tiempo. However, native speakers don't typically use tiempo for those phrases. They actually use "hora" or "hour to go," "hour to eat," "hour to go to bed." Without knowing the above about the Bible's usage of day and hour to mean time, it is very easy to misunderstand it to be giving a list of what time units you can't know (day and hour) and to be implying that the time units left out are indeed knowable (the year and month). Even an extremely careful and wise pastor of mine said from pulpit once that, "no man knows the day or hour...but it doesn't say year," and then went on to speculate on the year of Christ's return. I carried that misconception with me for probably 15 years because I never had a reason to question it. Finally, a few years ago after studying for several years on my own, I realized there is a big problem with that interpretation. It ignores the preceding context that leads up to Jesus feeling the need to point out that we don't know the day or hour. In each instance, Jesus admonishes believers to stay alert, don't backslide, don't sin...because...we don't know the day or hour (Mt 24:36, 42; 49-50; 25:13; Mk 13:32-33; Lk 12:45-46). Clearly, even knowing just the year of Jesus' coming far in advance removes any fear a person might have of being surprised by Jesus' coming. It completely nullifies his admonition to be on your guard. It makes no sense. #2: "Day or hour is only code for the Day of Trumpets (and not a limit on knowing when)"
A more recent interpretation gaining popularity comes from the Messianic and Hebrew Roots movement. It correctly teaches how we know from other passages that Jesus comes for the rapture on the "last trump" or the "7th trumpet" or the Day of Trumpets. This is the same day known today in Judaism as Rosh Hashanah or in the Bible as Yom Teruah. The Day of Trumpets is unique among the holidays in the Bible in that it is the only one which arrives on the first day of the Hebrew lunar month. The difficulty with a feast celebration coming on that day is that it may follow the 29th or the 30th of the previous month, depending on whether the moon is sighted on the 29th or not. For this reason, it is supposedly even referred to as "the feast that no man knows the day or hour of" or the "hidden feast." Given this, one Hebrew Roots teacher compared Jesus' day or hour statement to someone in America saying, "I'm not telling you when I'm showing up, but: gobble, gobble, gobble!" (inferring "Turkey day" or the Feast of Thanksgiving). In other words, Jesus was inferring the Day of Trumpets by "day and hour." I can wholeheartedly agree that the inference is there. However, I cannot agree that that is all that's there for the reasons explained already above. The context requires that the plain literal meaning of the words still apply. They are still binding. He did not tell us when he is coming as he himself does not even know, so we must always be ready. Some might think that if we know that he is coming on a future Day of Trumpets, that this also breaks the context. But not if we don't know the year. The year is the all important thing which everyone wants to know that we simply cannot use the Bible to figure out. #3: "You can't know anything about timing (so don't waste your time studying prophecy)"
This is the most common view among Christians. They think Jesus' statement expressed a prohibition of knowing anything about timing. Understandably then, this is the main excuse they offer for why they don't study prophecy (or why no one else should). Why study something that is considered "sealed?" However, there are serious problems with this theory, too. Jesus specifically spoke about the exact time ("day or hour") of his coming. He did not preclude us knowing other details or set any other limit or say not to learn what you could. It is easy to see why if you read through the rest of the prophetic writings. You'll find that Jesus mentions the writings of Daniel. He says that when you see the Abomination of Desolation, then you'll know Great Tribulation is coming soon. Daniel gave us such timings as the final seven years of the 70th week, and the 1335, 1290, and 1260 days. These complement the 42 months and 3½ years given to John in Revelation. We are also given the sequence of events in Revelation through the seven seals, seven trumpets and seven bowls. All of this gives us more more information about timing than most Christians ever dreamed of. In fact, as I show in my book, we can study and follow the Sabbath Year cycle to know which one out of seven years the last seven years can possibly start, and which ones it cannot. This is not date setting because there are infinite possibilities that you only rule out one by one as you pass them. It only narrows down the possibilities. It does not allow you to stick a pin in the calendar on the one true date the Bible supposedly points to. Finally, as far as the common Christian idea that we should not study prophecy, the Bible actually encourages us to do so. It pronounces a blessing on those who read and understand prophecy where all these timing details are to be found (Rev 1:3). #4: "No man knows the day or hour means Jesus' coming is imminent, or can happen any moment"
It's definitely true that if all you had was Jesus' statement alone, one possible literal interpretation of it could be that it meant he could come at any moment with no prerequisites or advance warning. That would be a plausible explanation for why no one knows the time of his coming. Fortunately, we don't have just that one statement of Jesus on this subject. Earlier in the Olivet Discourse, Jesus gives several preceding events that he sums up as, "but the end is not yet" or "the end is not by and by." He then explains that there must come a few other major celestial and terrestrial disturbances which he labels as the "beginning of sorrows" and the "beginning of birth pains." #5: "We will never know the day or hour"
Above we talked about the verses telling us several aspects of timing. But are we forever limited to just that and kept from knowing exact timing? Actually, not and be warned, here comes the trickiest part of this entire discussion. Those who think we will never know don't seem to notice that Jesus did not use future tense in his statement about not knowing the day or hour. In other words, he did not say no man "will ever" know. He only used the present tense everywhere for this subject even though he uses future tense often in other nearby passages. The reason? Because it's clear from other prophecies that one day we will know the day of Jesus' return. How? One way has already been touched on. Jesus talked about the Abomination of Desolation spoken of by Daniel. If you go to the end of Daniel (Dan 12), you will find that the angel tells him that this event on the Temple Mount (and the cutting off of the resumed animal sacrifices there) happens 1290 days from the conclusion of the 70th week (when Jesus returns). Therefore, when the Abomination of Desolation happens, you can calculate and know the date of Jesus' return (for the rapture). 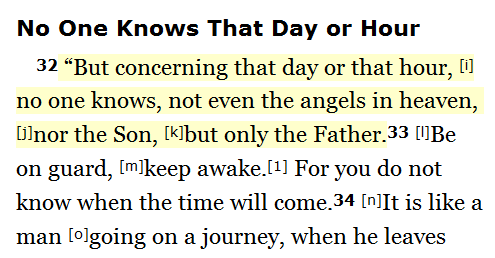 Jesus of course knew about this prophecy and never intended to say that "no man will ever know the day or hour." When the Abomination of Desolation happens, we can and will know. Further, an end time prophet can come along with new revelation, filling in needed details missing from the Bible to finally solve the riddle of exact timing. Elijah is coming, and to properly warn people, certainly will know when the end is coming. The Situational Change By When We Finally Do Know "the Day or Hour"
To the astute, this might seem to present a problem. We said above that the reason that our not knowing is always brought up is to remind us of an (extra) compelling reason to not fall asleep and backslide into sin. (Jesus can come back and catch us with our pants down, so to speak.) If that extra incentive is gone and we know the exact date Jesus is coming, what's to stop us from "partying like it's 1999?" If you know the rest of the story of the end times including how God intends to save us, you'll see it's not really a problem at all because by that point, circumstances will have changed. The change will remove the several key reasons we all have today for sinning and backsliding. Now, you probably never noticed it, but Jesus never told us to wait until we see the Abomination of Desolation. He said instead that when you see it, run as fast as you can not even stopping to get a coat. In other words, if you wait till then, it becomes a urgent, time-critical situation. Not the kind of situation in which you want complications like it being winter or having pregnant or nursing mothers accompanying you. The obvious conclusion from what Jesus described is that it would be best to pack a bag with your coat, your cloak, some frozen mother's milk, and leave early, in faith, rather than wait until you actually see the Abomination before you get moving! Therefore, people of understanding and faith will already be gone by the time the Abomination of Desolation happens. They will have left to the "place prepared in the wilderness to be fed" for the 3½ years of Great Tribulation (Rev 12:14). God's leaders will no doubt tell them what is coming and when and in faith they will leave. Probably the ones who are still around when the Abomination happens had doubts or apathy about what the prophets said. And here is how this future departure solves the apparent problem with knowing the day and hour and being tempted to backslide. We will no longer be in the world and tempted to backslide in the same way or to the same degree as we are now. In the world today we have to overcome ourselves, the temptations and cares of the world, the negative peer pressure of the wicked around us, and Satan or the evil spirit world. We take it for granted, but that's a big burden and we don't have to put up with it all forever. Once we are led out of society into the one place prepared for our protection and feeding, most of that will be gone. We'll be under prophets teaching us pure unified doctrine. Today's rampant doctrine disunity and infighting will be gone thanks to that, just as it was under the apostles in Acts 2. We will also have comprehensive positive peer pressure for a change. It won't be like the exodus of ancient Israel where only a notable few were faithful servants and lovers of God (Moses, Joshua, Caleb, Phineas, the elders) while the rest were only along for the ride and grumbling and complaining all the way. It will be reversed in that only ones there will be the called, chosen and faithful (and their families). When Jesus said that no man knows the day or hour, he chose his words carefully and was also careful not to say the very things that so many people think he meant. He did not leave out "year" because we actually could know the year of his coming. He did not say don't study prophecy as if you could not understand anything at all about timing. He did not say he was "coming at any moment." Finally, he did not say we would not one day finally know the timing of his coming (at least when the 1290 day count starts with the Abomination of Desolation). After all, he did not refuse to answer the apostle's question on the sign of the end, but told them plainly (Mt 24:14). Only when you look at Jesus' statement in its cultural context and compare other prophecies related to it can you understand what he really meant. He was saying that we cannot know the exact time of his coming far in advance, even though it is obvious that it will come on a future Day of Trumpets. He also taught that as long as we continue not knowing, it should give us extra (needed) incentive to "stay awake" or sober-minded instead of apathetic and liable to backslide and fall into sin. Nowhere does Jesus say that the “day and hour” is pre trib as they like to say. His imminency (Emanancy:) is “After the tribulation (Matt. 24:29 Luke 21:28). Those who believe pre trib must be informed of this. It sounds like, from reading this article, that you have a post-trib Rapture belief. Is this correct? Wyatt, exactly I believe what Jesus and Paul said about the rapture, “FIRST the man of sin then, our gathering to Christ” (2Th 2:1,3) and “after the tribulation…the angels will gather the saints” (Mt 24:29-31). True. No one can know the day of the Lord’s return until the abomination is setup, and no one knows when that will happen, so Jesus did not contradict Himself. Pre tribbers don’t understand these types of verses, including Acts 1:7. Actually, I agree with that and am a pre-tribulationist. Nothing you said would contradict a pre-trib understanding. My only problem with your statement is that I’m sure your implying “the Lord’s return” is equivalent to the rapture, which obviously I disagree with. There will be a 3rd temple, because you cannot offer sacrifices and oblation in a human body,which in a way is the temple of God for Christians. PS 83 nations CONSPIRE to attack ‘Hidden Ones” not that they destroyed these hidden ones. Obviously during their conspiracy they are destroyed like zeeb and zalmuna (by ambush) according to what the psalmist wrote. It is interesting that these psalm 83 nations are identified in Ezekiel 25 with different names and are destroyed by men of the East. But these men of the East are not from China,geographically,but from kedar and hazor(the Confederacy capital ofcanaanites,amorits,hittites,perizzite,jebusite and hivites in Joshua 11 and judges 4 ) in jer 49. These men of the east are later destroyed by the end time nebudchadRezzar of Babylon not the nebuchadNezzar of Old. This nebudchadRezzar is later destroyed by the king of the north ,which is a Confederacy of nations in jer50:9,41. Jer51:11,27,48. I also agree that the rapture (harvest of the wheat ) is at the beginning of the tribulation coinciding with the birthpang delivery of the rev 12 woman, but another rapture (harvest of barley) occurs at the second coming of Christ/end of the tribulation. The English translation of “no man, KNOWS,the day or hour” ,truly needs to be re transliterated . The English verb “KNOW” was MISTRANSILITERATED from the Greek PAST VERB TENSE “EIDO”(Strong’s concordance 1492) which means SAW/SEEN. So that verse should read-no man has seen,the day or hour. This gives the verse a new meaning of an UNSEEN VISION about the day or hour in the future. So as at when that Scripture was written no man had seen a vision of Christ’s second coming. Remember this scripture has to do with the second coming rather than the rapture, because according to verse 42 of Matt 24 it is the HOUR of the Lord’s coming which is different from our gathering unto him in the sky(rapture). I have re-read this article and it appears to focus a lot on the TIME aspect and does not address the WHO the text is referring to. Most of the time I read “no MAN knows”, in the present tense with Jesus is talking. Now the Gospels where written in 50’s or 60’s A.D.
Jump to Revelation which is said to be written 95-96 A.D. definitely after Jesus resurrection as he is in heaven with God. Verse 1 is overlooked by many and says “The revelation from Jesus Christ, which God gave him to show his SERVANTS what must soon take place”. I believe this provides a positive confirmation and does not break scripture. David, that’s an interesting theory and chronologically it works, however not with the contextual reason Yeshua had for warning about “no man knows:” “therefore always be ready because you don’t know the day or hour.” The point is that you won’t (ever, not just for half a decade) figure out when he’s coming back from the Word of God alone as even he the WHOLE Word of God made flesh didn’t know, so you must stay in repentance and not backslide rather than get apathetic because you know you have ten more years. Also, remember, Revelation is just a subset of the Word that was written later that Yeshua already was or had at least had access to! He was the full Word made flesh but yet he said “only the Father knows the time.” So, today just as then, no man knows the timing yet for sure based on the Bible alone unless he gets a special revelation from God. Tim, I agree with your point that we must be “ready”. If you are right with God then you should be ready all of the time, but we are all human and still have a fallen nature. That does not negate the fact that revelation points to the “Last Trumpet” as the first resurrection, if it is the Mystery that Paul refers to as well as Jesus has to fulfill each of the feast days. The whole discussion of “Who knows When” should not really be the debate as it distracts us from the fact that he IS coming, WHY he is coming and WHAT will happen when he comes. I believe this is the part that has been missed in prophecy teaching in the past. Thank you for bring may of these facts to life for me as well as others reading you posts.